A very thoughtful piece, and thank you. However, what the entire piece essentially boils down to as a defence of this fellow, is a paraphrase of what every obnoxious blowhard sooner or later offers in his: “I’m only saying what everyone’s thinking”. Perhaps somewhat correct in this case, in the context of those times. And? How does one celebrate this now? From an historical point of view, yes, his entire corpus deserves to be valued as an insight into and reflection of the attitudes of those times. But, there’s really no need to give succour to the worst of them, in highlight what you might want to regard as the best. He did not just attack individuals, but entire populations, and it really didn’t bother his conscience to visciously malign entire nationalities or races – men, women, and children – to make a political point to further what he considered his ideals. After showing peoples in a manner that flattered the ascendancy’s moral egotism, sometimes he relegated those people – like blacks – back to the sin bin when they failed to live up to what he wanted. You call that fairness, I call it shameless pandering to moral egotism and self-righteousness. That’s not even meant as a condemnation, just an accurate reflection of the attitudes of the time, which he so successfully reflected and provoked. I see no reason to celebrate them through celebrating his body of work. Thank you for writing and sharing your opinion. I appreciate your thoughtfulness also. As I reflect upon very well-known figures of history, founding members if you will of U.S. history, who turned their heads at the issue of slavery when the issue did surface, and did not have the courage to address it head on when the tenets of our democracy were being formed. Instead they compromised their values for economic and political reasons, manycontinued to be slave owners, and yet, these figures remain honored and venerated in our American story. Our history is full of very flawed human beings. Yet their role in history cannot be denied or ignored in a much more conspicuous manner, Nast’s flaws pale in comparison. I agree with you, Nast was full of self-righteousness, as were many others then and now. No argument there. His work as a cartoonist, in influencing others in the field of political art, is worth a place in history. He became disillusioned with African Americans for their post-Reconstruction partnerships with Southern Democratic politics – he was fed up, as were many Radical Republicans for the failures with promises that early Reconstructionist theory had pro-offered. He was blind as a bat to Grant’s corrupt administration and historians have more or less inexplicably let that go. But Nast got people talking and thinking-and was, at least in the beginning when it counted most, a strong abolitionist. 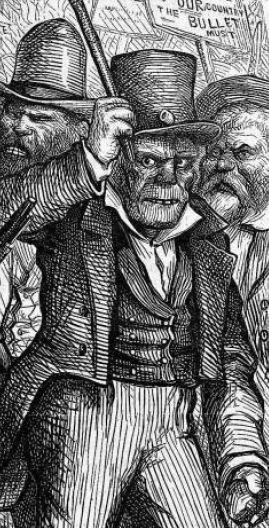 His attacks on the Irish, were not, in my (Irish) opinion, racially motivated at all, but were strongly tied to Democratic politics via Tweed. 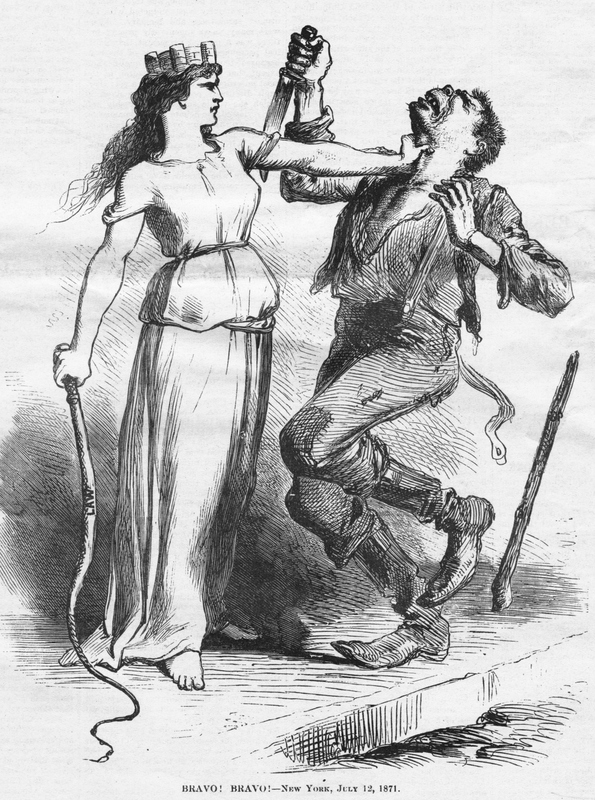 Hatred of the Irish-Catholic was pervasive and primarily an English import to the U.S. where it continued to flourish. If he drew nice pictures of the Irish, how would we know? Caricaturists set their attack pen on those they feel are corrupt, unjust or hypocrites. He drew many policemen (supposedly Irish) as completely normal. His Columbia sets laurels upon the heads of the Irish police who conducted their profession with virtue. His art normally didn’t focus on the good people, unless they were a foil/victim to his villain. Nast was and remains controversial – like many figures in history who are honored far more extravagantly than in a local or regional hall of fame. If Nast ever is inducted, that controversy deserves to be addressed – kind of like the many asterisks that are or need to be placed in the MLB Hall of Fame next to many notable records. Nast is an important figure in history, and his perspective, flawed, and just as often times spot on, are opportunities to teach others about opinion, race, toleration, stereotype and other important lessons. He had, as an individual, a right to his opinion, and he was paid well to express it. There was a sizable audience for it – not an excuse, but his opinions and his work reflect his time as well as influenced it. In some cases, he may have indeed pandered, and other times he bucked the trend, particularly concerning the Chinese. I don’t see his induction into the Hall of Fame as a celebration, but more as a recognition of his influence. Entire races and peoples did not object to his being nominated. His induction was blocked by organized protests by Irish Catholics who are understandably reactive to his images. 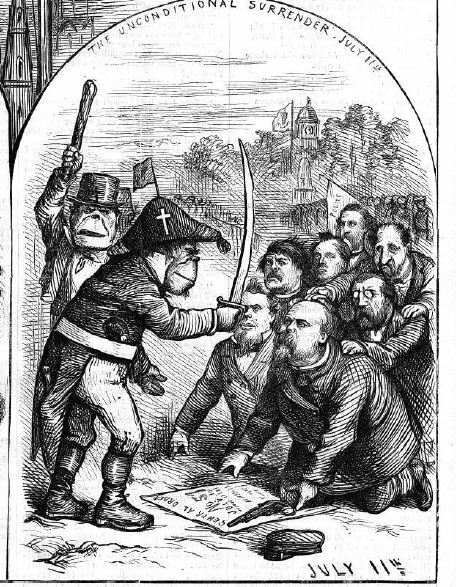 Nast attacked specific Irish Catholics of his day – which were many – for their pro-slavery stance, their allegiance to Tweed, and Tweed’s pandering to the Catholic Church and position on school funding. I truly believe if Tweed had not been involved, Nast would have had little reason to draw the Irish the way he did. 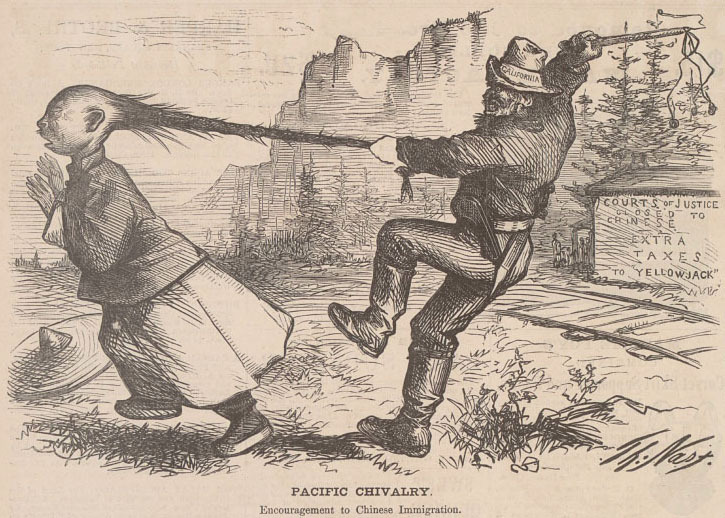 When the Irish began to attack the Chinese, it only stoked his resolve to keep up his attack. Most Irish today don’t like to talk about that part of their history. Our collective memory fails to recall these moral lapses. Why did the Irish, so oppressed for so long, so easily become the oppressors against the Chinese? But they did, and succeeded in pressuring for the legalization of the worst kind of racism. It is an inconvenient truth. Not many Irish today like to reflect on that part of their history. If pandering to public opinion disqualifies an individual, like Nast, for recognition of their body of work, we should strike most elected officials past, present and future from receiving any similar type of award or acknowledgement.